Megan earned her master's degree in Marriage and Family Therapy from the University of Nebraska-Lincoln. She has experience working with anxiety and depression, mood disorders, couples and families, LGBT issues, military service members and diverse populations. 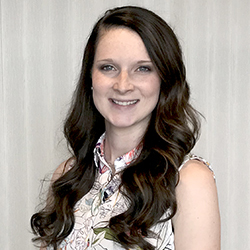 Megan is certified in medical family therapy, trauma-focused cognitive behavioral therapy, and has completed level 1 of the Gottman Method couples therapy. Megan brings a strong interest in personal wellness and helping others with their overall well-being. She is currently working toward becoming a certified wellness coach. Megan approaches treatment utilizing cognitive behavioral therapy techniques and builds on client strengths to help create change.